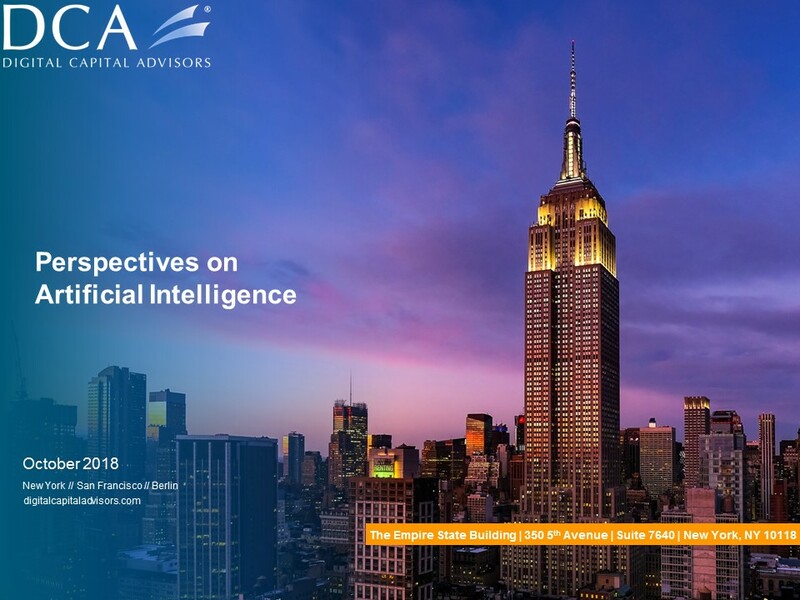 August 10, 2017 - Digital Capital Advisors is pleased to release our latest sector deck, Perspectives on Artificial Intelligence. The proliferation of data, along with advances in technology, has created a race for companies looking to utilize Artificial Intelligence, Artificial Intelligence has become ubiquitous, touching every industry. With 90% of the data on earth having been created in the last two years, the stakes are even higher for suitors looking to capture a piece of this massive $2 billion market opportunity. While potential obstacles such as the lack of transparency and the fragmented ecosystem threaten to slow AI's growth, the future for this sector is bright-especially as opportunities such as conversational AI, autonomous systems and AI learning systems continue to grow. Digital Capital Advisors' report dives into the headwinds and tailwinds, as well as highlights the major AI and machine learning players currently vying for market share of this exciting sector. Please submit a request below to receive your copy of Perspectives on Artificial Intelligence.